Before I got into jazz, I was trained in classical piano and flute, having started piano lessons at school from the age of eight, and then taken up the flute at tern so l could play a second instrument to qualify for a music scholarship into the Senior School. At the time, I had wanted to learn the saxophone instead, but my parents had refused on the grounds that a) it would annoy the neighbours, and b) it wouldn't fit in my school bag so I'd probably leave it on the bus. However, two years after starting the flute, I was still dying to give the sax a try. Around this time, my parents had taken me to see the Big Chris Barber Band at our local theatre, figuring that I might enjoy the music and it at least it was a night out. That night I sat in the front row and was captivated by what l heard. I was especially pleased to see there was a young woman playing in the band namely Amy Roberts. There was hope for me! We got in touch with Amy through her website and agreed to meet her at a local gig a few months later. Meanwhile, after attending a saxophone day workshop in Sandbach led by RNCM tutor Andy Scott, I began to have regular lessons with him; I also found myself upgrading to my Selmer Mark VI alto, and playing tenor sax for the first time in school's main Big Band. I subsequently met Amy and she was so lovely and kindly invited me to my first ever sit-in, with her quintet at the Pershore Jazz festival in 2015. The audience that day were really kind to me and I began to get ideas and a taste of what might be, though it was obvious there was a heck of a lot of work to be done! As a family, we started going to our local jazz club in Wilmslow where I got to not only hear some of the greatest jazz musicians around, but the promoter very kindly facilitated me sitting in with them too, giving me the most unique opportunities to listen and learn how to play and perform. 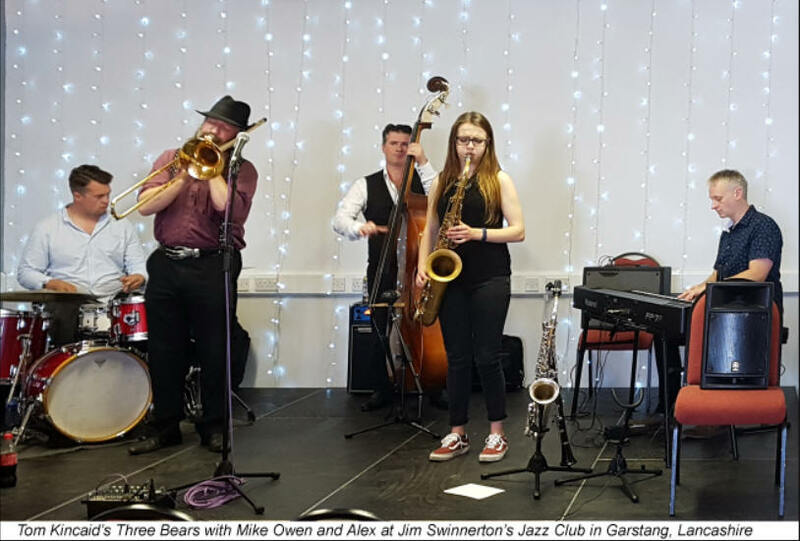 This extended to visits to other clubs in my home area in the North West and meant I began to listen to and play alongside a huge variety of established jazz artists. My jazz education has been significantly helped by having jazz theory lessons from pianist Dan Whieldon, who teaches at school (how lucky was that! 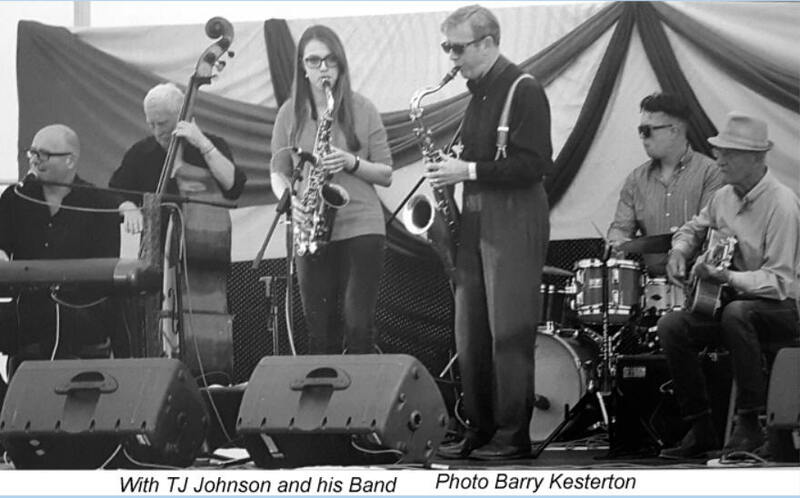 ), as well as attending the National Youth Jazz Collective summer school each year. The NYJC experience is phenomenal and I would highly recommend all aspiring young jazz musicians to apply to go on the summer school as they offer a week of outstanding tuition and playing experience lead by legendary performing jazz musicians. I have found it so beneficial musically and have had a brilliant time making friends with other young players; it's reassuring to know that there is going to be a strong future for jazz. Much of my informal learning has been on the job, where l have been thrown in at the deep end playing with all sorts of Mainstream artists and Traditional New Orleans bands at local venues. I am extremely indebted to these established musicians who have so kindly welcomed me to their stage. Far too often I have found myself taking solos in tunes I have never even heard before - all good practice for my ears, I guess. And if only l had a quid for every time I've heard someone say that l have brought the average age of a Traditional jazz band down to 70. But seriously, I'm determined to do my bit towards the apparent revival of young people playing and enjoying jazz and Swing. I also think it is really important for people of all ages to support their local jazz clubs and keep their minds and ears open to new artists, as without this attitude, people like me will have nobody to play to in the future. I have been very lucky to have gradually built up a steady schedule of gigs, guesting and depping with various bands, big and small, as well as playing at clubs and festivals as the Alex Clarke Quartet for Mainstream material and the Alex Clarke Hot Five for more Traditional stuff. My most recent project has been to release my first CD. As well as wanting something to offer people to take away from gigs, I also needed some good quality recordings of my playing to use in promotion. The CD is entitled 'Mirage' I did all the arrangements and it features the incredible playing of Tom Kincaid (piano), Ed Harrison (bass) and Eryl Roberts (drums). After a day of fun actually playing, Tom and I spent time mixing the tracks and creating the artwork for the case. All new stuff for me, but fascinating and exciting. 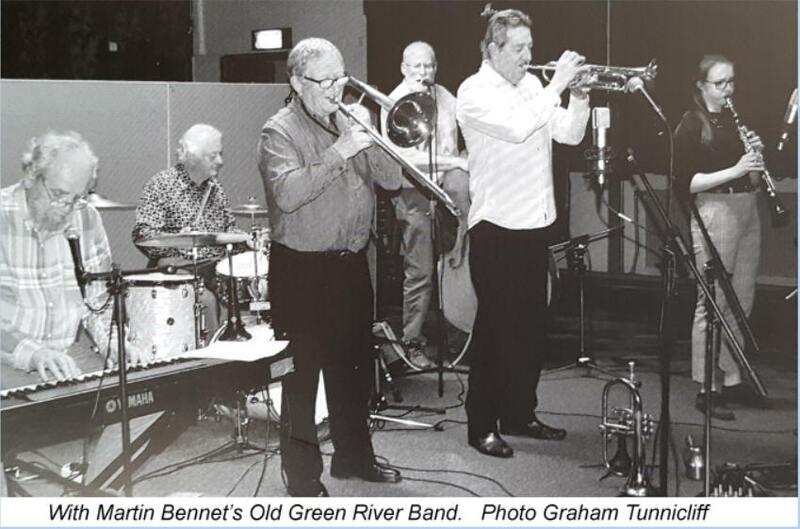 In addition to this CD, I can also be heard playing reeds with Martin Bennett's Old Green River Band on their latest recording taken live at Burton-on- Trent Jazz Club in April, 2018. Meanwhile, amongst all the jazzing, I have been desperately trying to stay on top of my A level studies at the King's School in Macclesfield: I sometimes feel like school didn't particularly understand what I do with my life outside of the classroom, and just saw me as a slightly disorganised student who o nly just made homework deadlines and always looked a little bit tired in lessons. I remember one particularly hectic week where I managed to turn up to maths in a state of chaos without my school bag, and then had to spend the next ten minutes of the lesson trawling round school wondering where on earth it could be, before coming back to the lesson empty-handed - I think my teacher was more concerned than angry at this point... It has definitely proven quite hard to keep school and parents happy whilst building the beginnings of a career that I hope will one day be my sole preoccupation. School are used to their students going into the fields of law medicine and veterinary science, and I feel like they found the idea of me going on to become a jazz musician a little bit shocking. I have learnt to survive on far too little sleep, plan my logistics to the nearest minute, eat cold curry out of Tupperware in the car on the way to gigs, and somehow still hand in (some) homework on time. On a normal school day l would I get into school at 7.30am each day to either do some practice or catch up on all the homework l should have done the night before, and then work through breaks, frees and lunch in order to give myself the time to go to gigs in the evenings. I managed to establish myself in a little 'office' in the music block (even staff would knock before they entered) that felt like home, and from here I learnt new pieces, planned set lists, worked on arrangements, took sneaky phone calls for bookings and maintained my website until I got home - usually around 7pm - where I'd start all over again! All the while that I am driving, working or relaxing I am always listening to a huge variety of jazz artists from whom I get my inspiration. Their different styles and sounds fascinate me and have helped to shape my own playing - Phil Woods and Tubby Hayes are currently at the top of my car playlist. I am now excited to have a scholarship to study jazz at the Royal Birmingham Conservatoire starting this month, and am looking forward to joining the Birmingham and Midlands jazz scene whilst still maintaining a presence in the North West where I started. I will need to discover London too at some point, but let's keep it one step at a time... I expect to be doing even more travelling and to spend very few evenings or weekends sitting in my student room. One of the reasons for choosing Birmingham is that its location enables me to access the North West, Midlands and London relatively easily, plus it obviously has some brilliant tutors working in the most fabulous new building you've ever seen. I would highly recommend a visit to the Eastside Jazz Club at the Conservatoire; they have some impressive artists playing most nights and I'm really hoping to be part of the conservatoire's Big Bands, especially the Ellington Orchestra that plays there every other Monday. Outside of school and jazz what do I enjoy? 'Lots of things' is the answer, but time is always the limiting factor as to how much else I can squeeze into my life. I play tenor sax in a Pink Floyd tribute band which is great fun - I love a good blast of loud prog rock and the chance to put out something a bit different. I have been a keen horse rider since the age of five and still find occasional time to ride, usually with my mum from whom I get my interest (and the money for the lessons - can't afford that on a student jazzer's money...). As for my aspirations after Music College... Well, I'll have to see where it takes me over the next four years. I hope that during my time there I will develop and refine my Traditional and Mainstream jazz playing which is where my heart lies at the moment, but I also want to diversify into other branches of jazz so l am able to take up as many opportunities for work as I can find. I'd love to cement my current bands on the festival and club circuits and maybe do some regular work with other musicians whom I have always admired. At some point, I would like to travel abroad with my playing and I expect that in the future I'll do some teaching too, to boost my playing income. I'm fully aware that I have chosen a hard profession to get rich in, but I'm confident that I'll have plenty of fun times ahead, as well as all the late nights, hours of driving and loads of preparation and practice.